On July 4th, 2003, a statue of " Soldiers of the Summit" was dedicated to the 10th Mountain Division of WWII in Breckenridge, CO. It was a big to do. Lots of people were on hand! There was a parade and the U.S. Army even provided a helicopter flyover, but not one marching band! That's when I decided to become the founder of this band! The Senior Staff officers will assist the Executive Band Director in all aspects of the successful operation of the Band. 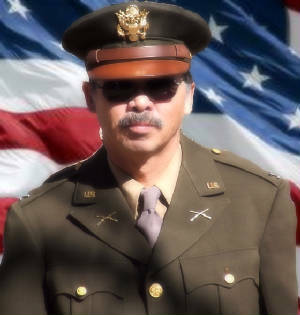 Col. Hoevers, founder and executive director of the band, will serve as the "Division Commander". Our music selection will consist of the marches of John Phillip Sousa including Semper Fidelis,The Washington Post, The Stars and Stripes Forever, El Capitan and The Liberty Bell. We will also play the recognizable marches of all five branches of the Armed Forces of the United States (including The U.S. Coast Guard) and, of course, The Star Spangled Banner. "It's a privilage to live in Colorado!" We are a re-enactment organization only, and do not claim to be an active duty mitlitary unit. We are not affiIiated with any branch of the armed forces of the U.S. and have no edorsements from either. We are a non-partisan organization and any participation in a political event does not imply endorsement of any kind! Full band practices will be scheduled in various locations throughout Colorado.